A golden spire crowning a conical wooded hill, Swayambhunath Stupa is the most ancient and enigmatic of all the holy shrines in Kathmandu valley. Its lofty white dome and glittering golden spire are visible for many miles and from all sides of the valley. Historical records found on a stone inscription give evidence that the stupa was already an important Buddhist pilgrimage destination by the 5th century AD. Its origins however, date to a much earlier time, long before the arrival of Buddhism into the valley. A collection of legends about the site, the 15th century Swayambhu Purana, tells of a miraculous lotus, planted by a past Buddha, which blossomed from the lake that once covered Kathmandu valley. The lotus mysteriously radiated a brilliant light, and the name of the place came to be Swayambhu, meaning 'Self-Created or Self-Existent'. Saints, sages and divinities traveled to the lake to venerate this miraculous light for its power in granting enlightenment. During this time, the Bodhisatva Manjushri was meditating at the sacred mountain of Wu Tai Shan and had a vision of the dazzling Swayambhu light. Manjushri flew across the mountains of China and Tibet upon his blue lion to worship the lotus. Deeply impressed by the power of the radiant light, Manjushri felt that if the water were drained out of the lake Swayambhu would become more easily accessible to human pilgrims. With a great sword Manjushri cut a gorge in the mountains surrounding the lake. The water, draining away, left the valley of present day Kathmandu. 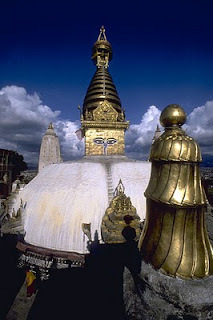 The lotus was then transformed into a hill and the light became the Swayabhunath Stupa. Swayambhunath's worshippers include Hindus, Vajrayana Buddhists of northern Nepal and Tibet, and the Newari Buddhists of central and southern Nepal. Each morning before dawn, hundreds of pilgrims will ascend the 365 steps that lead up the hill, file past the gilded Vajra (Tibetan: Dorje) and two lions guarding the entrance, and begin a series of clockwise circumambulations of the stupa (Newari Buddhists circle in the opposite, counterclockwise direction). On each of the four sides of the main stupa there is a pair of big eyes. These eyes are symbolic of God's all-seeing perspective. There is no nose between the eyes but rather a representation of the number one in the Nepali alphabet, signifying that the single way to enlightenment is through the Buddhist path. Above each pair of eyes is another eye, the third eye, signifying the wisdom of looking within. No ears are shown because it is said the Buddha is not interested in hearing prayers in praise of him. The area surrounding the stupa is filled with chaityas, temples, painted images of deities and numerous other religious objects. There are many small shrines with statues of Tantric and shamanistic deities, prayer wheels for the Tibetan Buddhists, Shiva lingams (now disguised as Buddhist chaityas and decorated with the faces of the the Dhyani Buddhas), and a popular Hindu temple dedicated to Harati, the Goddess of smallpox and other epidemics.The presence of the Harati Devi temple signifies the intermingling of the pantheons of Hinduism and Buddhism in the development of the religious trends of Nepal. As Buddhists had no deity in their own pantheon to protect against the dreaded smallpox, they adopted the Hindu deity for assistance. 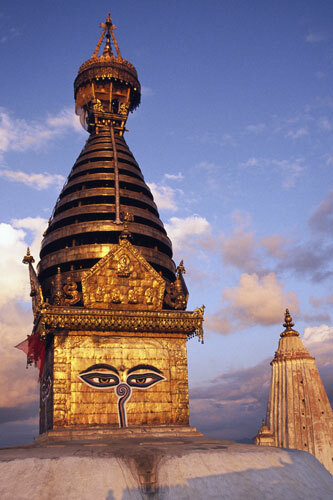 Atop Swayambhunath hill is another fascinating, though smaller and less visited temple. This is Shantipur, the 'Place of Peace', inside of which, in a secret, always locked, underground chamber lives the 8th century Tantric master Shantikar Acharya. Practising meditation techniques which have preserved his life for uncounted centuries, he is a great esoteric magician who has complete power over the weather. When the valley of Kathmandu is threatened by drought, the King of Nepal must enter the underground chamber to get a secret mandala from Shantikar. Soon after the mandala is brought outside and shown to the sky, rain begins to fall. Frescoes painted on the inside temple walls depict when last this occurred in 1658. The small temple has a powerful atmosphere; it is mysterious, stern and slightly ominous. Swayambhunath stupa is also called the `Monkey Temple' because of the many hundreds of monkeys who scamper about the temple at night after the pilgrims and priests have departed. Nearby the Swayambhunath hill are other important temples such as the Shiva Jyotir Linga temple of Pashupatinath, Boudhanath stupa, Changu Narayan, Dakshinkali, and Budhanilkantha. Readers interested in studying the sacred sites of the Kathmandu valley in detail are referred to the works of Bubriski, Majupuria and Moran listed in the bibliography.